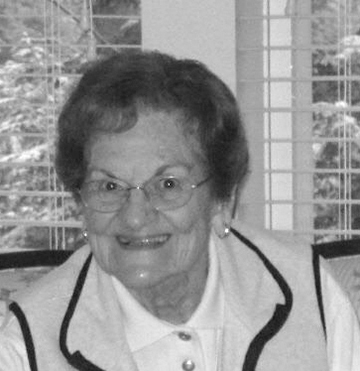 Catherine E. (Leverone) Souza, 99, beloved wife of the late Jesse J. Souza passed away on Monday, March 11, 2019. She was born April 5, 1919 in Everett, MA to her devoted parents Frank and Mary (Mullen) Leverone the 4th of 12 children. She had great memories of growing up in a large family with fantastic parents in Charlestown, MA and was titled the best family “ironer”. She always talked about spending summers at Uncle John’s farm in Walpole, MA; trips to Revere Beach and 5 cent movies. She attended Saint Francis de Sales Parochial School and Girls High School. Catherine married Jesse from Fall River, MA on February 24,1946 in Boston, MA, upon his return from six years of service with the Army during World War II. They started a family in Charlestown, MA where they had two daughters Nancy & Patricia, then moved to Wilmington, MA. 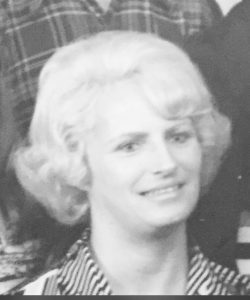 Once the girls were in school, Kay worked as an Administrative Assistant for the Superintendent’s office, Glen Road, Woburn Street, Wildwood and Wilmington High Schools for 37 years. She was a member of St Thomas-Villanova Church where she taught CCD. Kay earned an Associate’s degree from Northern Essex Community College and was a lifelong advocate of learning. In 1996, she moved to Merrimack, NH and enjoyed retirement building/decorating a new house and joined the Merrimack Senior Club where she enjoyed many trips, sewing, quilting and making holiday donations. She was an expert seamstress having learned to sew at a young age and always made her own curtains. Kay “Nana” is survived by her daughter, Patricia Walz; granddaughters and spouses Lorrie Berger and Bret Reis, Lisa and Austin Cannon, Lynette and Joseph Doyle; great grandchildren Austin Cannon V, Kaitlyn Doyle, Jacquelyn Doyle, Samuel Cannon and youngest brother Fred Leverone, his wife Elaine and many nieces and nephews. She will be missed by all with her welcoming smile and “Hellooooo”. A private Memorial Service will be held at Nichols Funeral home in Wilmington, MA. Memorial donations in Kay’s name may be made to St. Jude’s Children’s Research Hospital, 262 Danny Thomas Place, Memphis, TN 38105.